Celebrating with a shell wedding theme? Our shell place card holders can serve as holders and favors! They make wonderful mementos for guests to take home and display a favorite photo or to hold a memo. 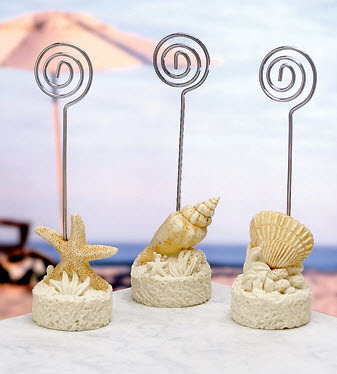 Also popular to use when having a beach wedding reception, each shell place card holder measures 4 7/8" tall and has a strong wire coil rising from the shell base. They are crafted with resin base that resembles sand, coral and shells and are made to last. These place card holders include blank place cards. Holders arrive individually poly-bagged.